The Emerald Express, Big Red Express and Franz’s Chair will all be turned on Friday morning with upload access from the Village and Creekside gondolas, said the release. 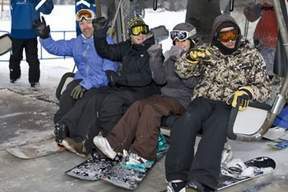 Skiers and snowboarders will be allowed up between 8:30 a.m. and 3 p.m. on Friday. Blackcomb Mountain is still scheduled to open next Thursday, November 24th, Whistler Blackcomb’s official opening day. The alpine forecast is calling for 35 centimetres of snow before Friday, which would bring the snowbase at Pig Alley up to 90 cm, said the release. Stay tuned for more details.